Laid-back South Austin spot for affordable, home-style Cajun classics and unique house specialties. 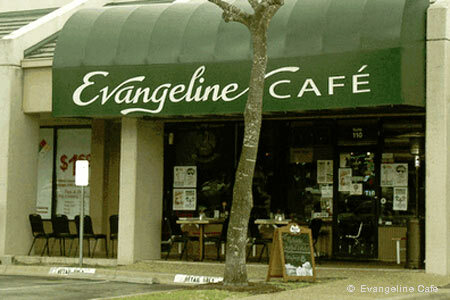 : Named for the Acadian heroine of a poem by Henry Wadsworth Longfellow, Evangeline Café pays tribute to Cajun food and culture with a solid bayou menu and a kitschy down-home aesthetic. Owner-chef and Louisiana native Curtis Clarke invites patrons to pull up a chair and enjoy soulful dark roux gumbo and buttery shrimp etouffée under the neon beer signs. All the Louisiana menu staples make their royal appearances: jambalaya, red beans and rice, and po’ boys by the dozen. But the real reason to keep coming back is the house specialties you can’t find on other menus, like the alligator sauce piquante with an intensely savory tomato-based roux swimming with tender white tail meat. Catfish smothered with crawfish maque choux (Creole corn chowder) is enough to entice Lafayette folk to make a trip to Texas. Some of the staple dishes cry out for extra dashes of Louisiana Crystal hot sauce. The live music, on stage Monday through Friday, is a mix of traditional Cajun and some of Austin's best soul/rock.